Nationality: American. Born: Charles Albert Browning in Louisville, Kentucky, 12 July 1880. Education: Attended school in Churchill Downs. Family: Married Alice Houghton (actress Alice Wilson), 1918. Career: Ran away from home to join a carnival, 1898; worked carnival circuit, then Vaudeville and Burlesque shows; joined Biograph film studio as comedic actor, 1913; directed first film, The Lucky Transfer , 1915; joined Universal Studios, began association with Lon Chaney, 1919; signed by MGM, 1925. Awards: Honorary Life Membership, Directors Guild of America. Died: 6 October 1962. "A Maker of Mystery," interview with Joan Dickey, in Motion Picture Classic (Brooklyn), March 1928. Skal, David J., and Elias Savada, Dark Carnival: The Secret World of Tod Browning, Hollywood's Master of the Macabre , New York, 1995. Geltzer, George, "Tod Browning," in Films in Review (New York), October 1953. Romer, Jean-Claude, "Tod Browning," in Bizarre (Paris), no. 3, 1962. Obituary in New York Times , 10 October 1962. Guy, Rory, "The Browning Version," in Cinema (Beverly Hills), June/July 1963. Savada, Eli, "Tod Browning," in Photon (New York), no. 23, 1973. Rosenthal, Stuart, "Tod Browning," in The Hollywood Professionals (London), vol. 4, 1975.
" Freaks Issue" of Avant-Scène du Cinéma (Paris), July/September 1975. Garsault, A., "Tod Browning: à la recherche de la réalité," in Positif (Paris), July/August 1978. Hoberman, James, "Tod Browning's Side Show," in the Village Voice (New York), 17 September 1979. Loffreda, P., in Cineforum (Bergamo), vol. 31, April 1991. Mank, G. W., "Mark of the Vampire—When MGM Challenged Universal . . . and Lost," in Midnight Marquee (Baltimore), no. 44, Summer 1992. Douin, J.-L., "L'horreur est humaine," in Télérama (Paris), 9 June 1993. Skal, David J., and Elias Savada, "One of Us," Filmfax (Evanston, Illinois), no. 53, November-December 1995. Wood, Bret, "Hollywood's Sequined Lie: The Gutter Roses of Tod Browning," Video Watch Dog (Cincinnati), no. 32, 1996. Although his namesake was the poet Robert Browning, Tod Browning became recognized as a major Hollywood cult director whose work bore some resemblance to the sensibilities of a much different writer: Edgar Allen Poe. However, unlike Poe, Tod Browning was, by all accounts, a quiet and gentle man who could nonetheless rise to sarcasm and sardonic remarks when necessary to bring out the best from his players or to ward off interference from the front office. These Universal productions were little more than pretentious romantic melodramas, but they paved the way for a series of classic MGM horror films starring Lon Chaney, from The Unholy Three in 1925 through Where East Is East in 1929. These films were notable for the range of Chaney's performances—a little old lady, a cripple, an armless circus performer, a gangster, and so on—and for displaying Browning's penchant for the macabre. All were stylish productions, well directed, but all left the viewer with a sense of disappointment, of unfulfilled climaxes. 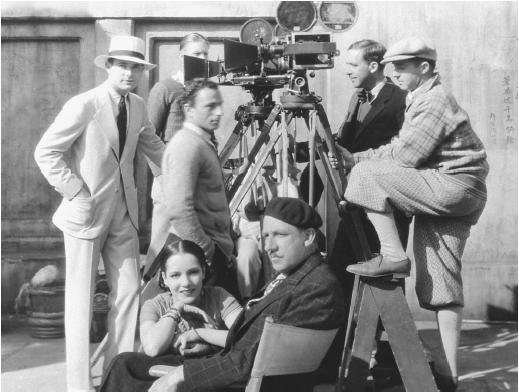 Aside from directing, Tod Browning also wrote most of his films. He once explained that the plots of these works were secondary to the characterizations, a viewpoint that perhaps explains the dismal, unexciting endings to many of his features. Tod Browning made an easy transition to sound films, although surprisingly he did not direct the 1930 remake of The Unholy Three. Instead, he directed the atmospheric Dracula , a skillful blend of comedy and horror that made a legend of the actor Bela Lugosi. A year later, Browning directed another classic horror talkie, Freaks , a realistic and at times offensive melodrama about the physically deformed members of a circus troupe. The film includes the marriage of midget Harry Earles to a trapeze artiste (Olga Baclanova). Browning ended his career with The Mark of the Vampire , a remake of the Chaney feature London after Midnight; The Devil Doll , in which Lionel Barrymore appears as an old lady, a similar disguise to that adopted by Chaney in The Unholy Three ; and Miracles for Sale , a mystery drama involving professional magicians. Tod Browning will, of course, be best remembered for his horror films, but it should also be recalled that during the first half of his directorial career he stuck almost exclusively to romantic melodramas.